For the last post in my Boston series, I decided to go a little closer to home. Literally. 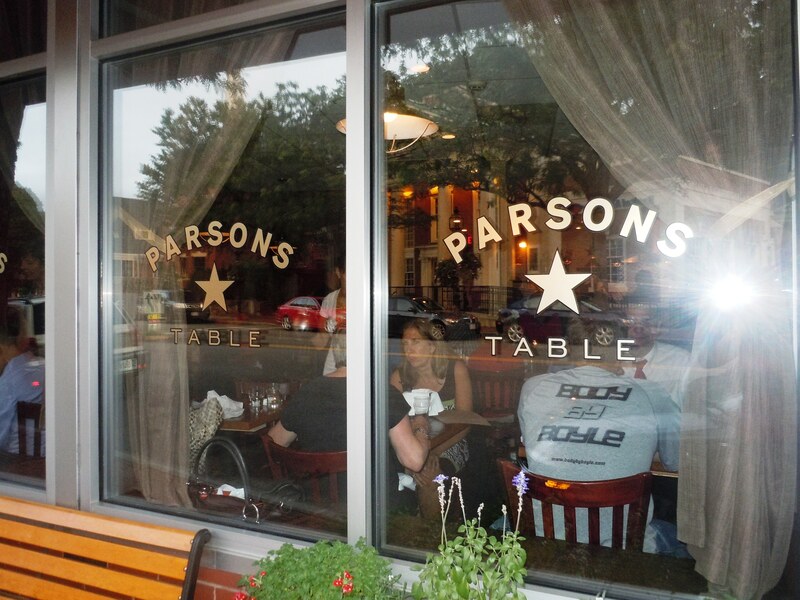 Parsons Table is in the Boston suburb of Winchester, which happens to be my hometown. But I swear I’m not biased—this relatively new restaurant has garnered glowing reviews, and even draws Boston dwellers to the suburbs for dinner (to be fair, it’s only about 15 minutes away). The menu is somewhat of a greatest hits list of classic American fare, reinterpreted in a relatively upscale way with lots of locally sourced ingredients and interesting accompaniments. The Parson’s Table Burger, for example, features a slow-roasted portobello mushroom, balsamic onions, house pickles, a brioche bun, and homemade kettle chips. Meanwhile, the Hand-Cut Fettuccini features house-made ricotta, and the Organic Pennsylvania Chicken is served with brown-butter risotto, native English peas, and maitake mushrooms. The décor is a reflection of the menu: homey, but classy. Beautiful wood tables are lit with a tea candle in a Mason jar, and the kitchen is completely visible in the back of the room through a dramatic archway behind the bar. I was slightly concerned about the prevalence of nuts on the menu, but the server assured me that she would inform the kitchen about my serious allergy. She did her job well because I had no problems, even though my mom got a dish that contained nuts, which I would assume they prepared at the same time as mine. The bread is from a local bakery, Iggy’s, which does make a good number of breads that contain nuts, so it should probably be avoided. We ordered exclusively off the daily specials list, unintentionally but with great results. 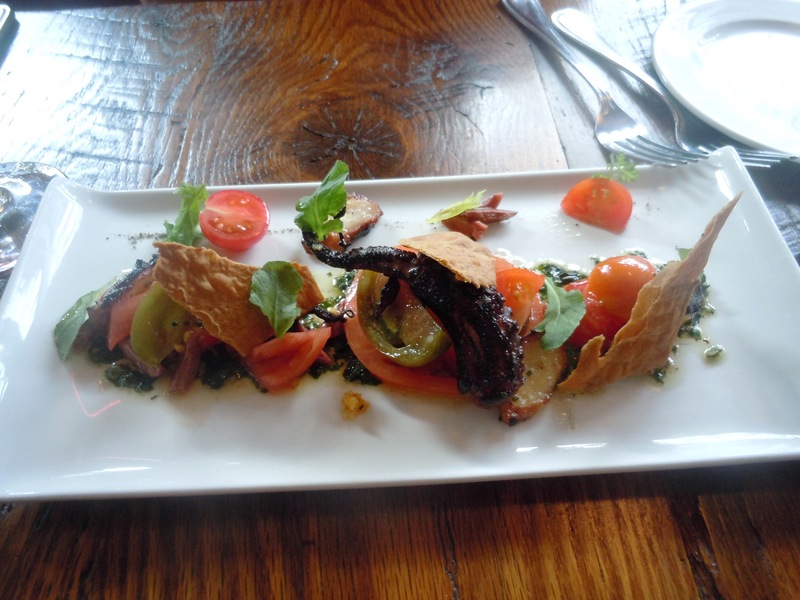 We started with the heirloom tomato salad with grilled octopus, salsa verde and an olive cracker. The octopus was tender and flavorful (it’s easy to turn grilled octopus into a chewy nightmare), and you could taste the grilled flavor. The dish was really light and delicious, drizzled with olive oil and oregano. For my entrée, I got the slow-roasted top sirloin, with Wards Farm corn succotash, Wright-Locke spring onions, maitake mushrooms, and baby tomatoes (Wards Farm is located in another Boston suburb, and Wright-Locke Farm is in Winchester itself). 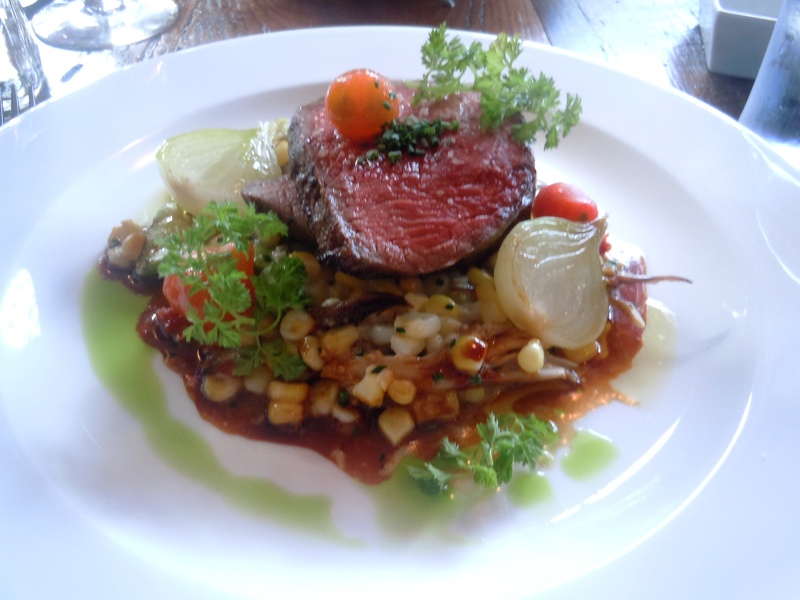 The sirloin was perfectly cooked, and the corn succotash lightened up the dish and added a really great summer flavor. 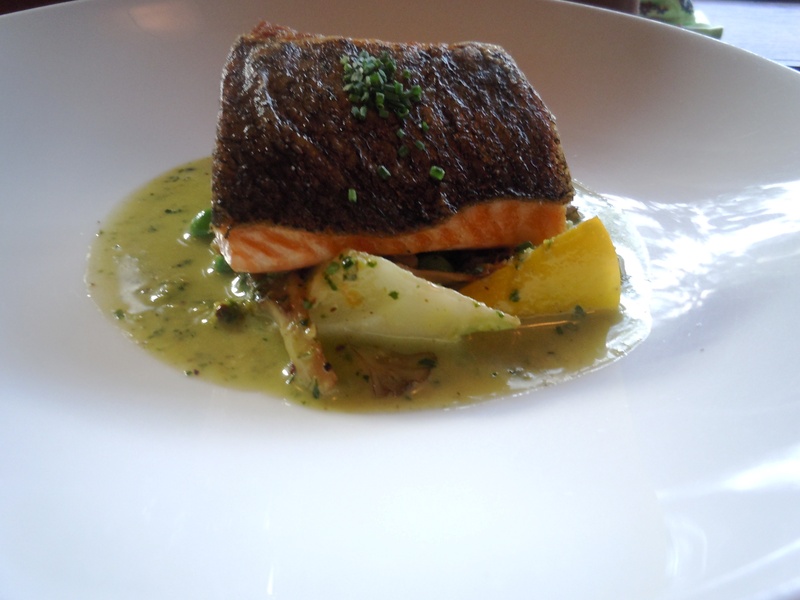 My mom got the Atlantic salmon with Wright-Locke squash, English peas, oyster mushrooms, and pistachios. Of course I couldn’t taste this one, but she told me it was delicious. Since the portions are pretty reasonable, we got dessert. 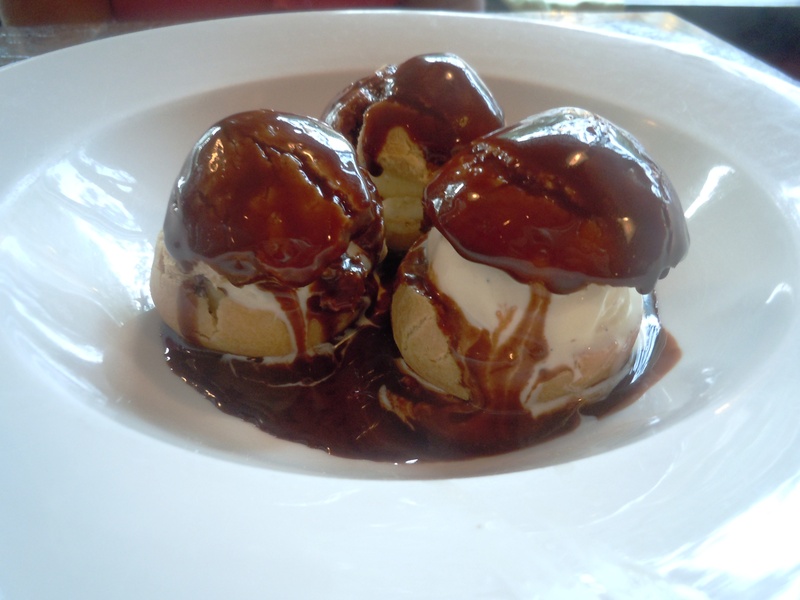 We split the profiteroles, as they assured me that both the ice cream and chocolate were nut-free. They were good, but the pastry was a bit dry, so I don’t know that I would order them again. With entrée prices ranging from $18-$25, the restaurant may not be an everyday choice, but is definitely worth making a trip to the suburbs. A trip to Boston wouldn’t be complete without a night in the North End, Boston’s Italian neighborhood. It is vibrant and quaint, and a fascinating hybrid of old and new—one of the city’s oldest neighborhoods (filled with tenements during the surge of Italian immigration in the late 1800s and early 1900s), it has been dragged into the 21st century but is still holding tight to its heritage and traditions. The main street, Hanover St., is lined with restaurants and bustling with both old- and new-world Italians, while the alley-sized cobblestone side streets look like they have been left untouched by the past two centuries. The neighborhood regularly features octogenarians sitting at café tables or in lawn chairs, smoking cigarettes and speaking (often yelling) a unique Boston blend of Italian dialects and English. Old North Church, the focal point of Paul Revere’s Ride, is at the center of the neighborhood, and you can feel the history and age in each cobblestone. In addition to its cultural and historic appeal, the North End has some of the best food in the city. Sure, it has its share of Americanized Italian rip-offs, but fewer than in New York’s Little Italy, in my opinion. And since Boston has one of the largest Italian populations in the country, you’re bound to find some great, authentic food, if you know where to look. One of my favorite restaurants in the neighborhood is Pomodoro (which is Italian for “tomato”), a tiny space with lots of big flavors. It has probably six or seven tables at most, accepts only cash, and doesn’t even have a functional website—making for an intimate dining experience that perfectly fits the true atmosphere of the neighborhood. Even the napkins convey the restaurant’s tone—they look like (and very well may be) dish cloths, like what you would find tucked in your grandmother’s apron, used to wipe the flour off her hands as she makes pasta. The server was very friendly but stretched pretty thin, as it seemed she was covering all the tables in the restaurant. She brought basket after basket of great bread (we were hungry) accompanied by an assortment of olives sitting in a dish of extra virgin olive oil. She also checked with the kitchen about nuts on everything we ordered, including the bread. She gave the disclaimer that the bread may contain traces of nuts because they don’t make it on the premises, but added that she has never seen anyone have a reaction to it. I ate it at my own risk (and was fine). The menu is notably nut-free, for the most part. The pasta options seem to overshadow the entrée choices, which are mostly Italian favorites like veal scaloppini but also feature less tired ideas such as baked cod in a rustic plum tomato sauce. 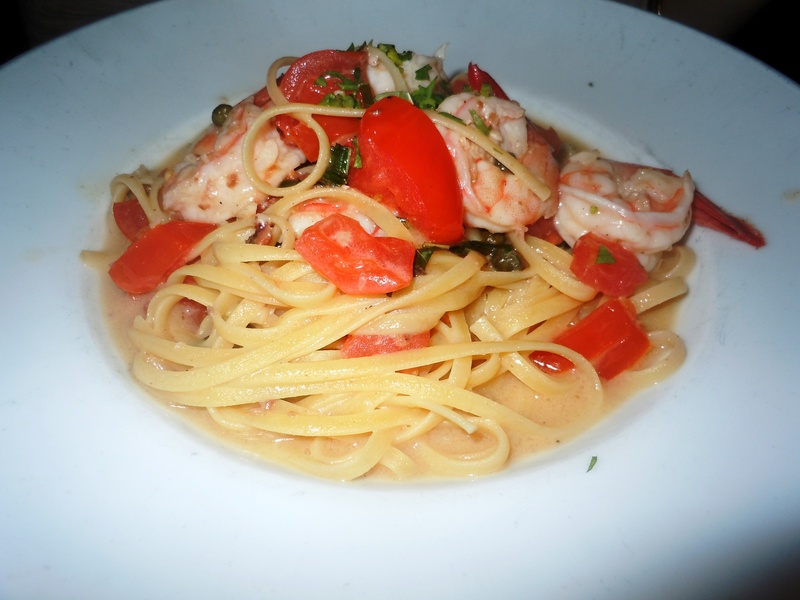 We decided to split two pasta dishes: the tiger shrimp tossed with linguini in a white sauce with garlic, extra virgin olive oil and fresh herbs (you could also choose a plum tomato sauce), and the P.E.I. 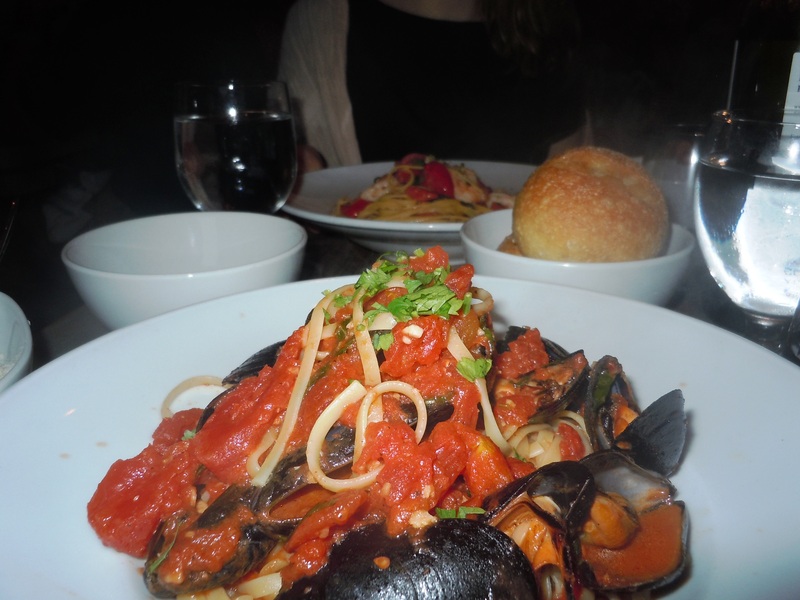 mussels marinara tossed with fresh herbs and linguini. While both dishes were outstanding, the tiger shrimp stole the show. The white sauce was buttery but still light, and the garlic was subtle. The shrimp was well-seasoned and the fresh tomatoes were a great addition. Overall a very flavorful dish, satisfying but light enough to be a great summer choice. 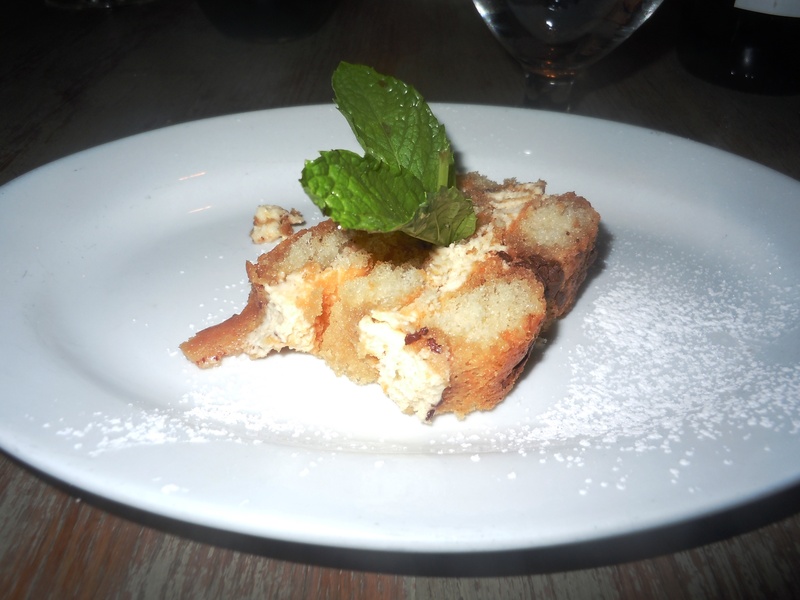 One of the best features of this restaurant, aside from the stellar food and cozy atmosphere, is the free dessert. That’s right, I said free. At the end of each meal, the server brings a slice (albeit a small one) of tiramisu, which is as delicious as you would expect. It’s also nut-free, made without any nut-based liquors like amaretto. The restaurant is not cheap, but it’s not unreasonable. After a bottle of wine and two entrees, the total came out to about $50 each, after tip. I recommend making reservations ahead of time, because the restaurant is so tiny. And remember to bring cash, because it’s never fun to run to the closest ATM when the bill comes, especially when you get hit with $5 in fees. But as far as the North End goes, it’s one of the best restaurants there is. Sorry for the long hiatus, everyone! I’ll kick off the fall with one of my favorite dining experiences in the past few months: Blue Inc.
My family and friends know that I don’t mess around with birthdays—and definitely not with birthday dinners. When my birthday approached this year, I spent a good 45 minutes researching and vetting potential spots for that night’s dinner—reading reviews, looking over menus, etc. And I ultimately landed on Blue Inc. in Boston. At just eight weeks old, this restaurant is a newborn, but its credentials are not. The restaurant is owned by Chef Jason Santos, the former executive chef at Gargoyles on the Square in Somerville, Mass., and a finalist in season 7 of the FOX cooking competition “Hell’s Kitchen.” A molecular gastronomist, Santos favors Asian, French, and traditional American flavors, and combines all of the above in very unexpected and unique ways. His style is certainly whimsical, which is reflected in everything from the bee pollen in the Lobster & Summer Truffle Soup to the cocktail list (which features drinks such as the “Anorexic Model,” the “Chilled Chocolate Afro Puff” and the “Study Au Broad”). Most importantly (in my mind at least), he doesn’t force his molecular gastronomy techniques down your throat (no pun intended). His use of foams, emulsions, dehydration, espumas and the like are quite restrained, used as sparing accents. At this point I should apologize to you, readers, because I did not intend to review this restaurant—with it being my birthday, I wanted to focus more on enjoying the food and the company than snapping photos and writing down flavors. 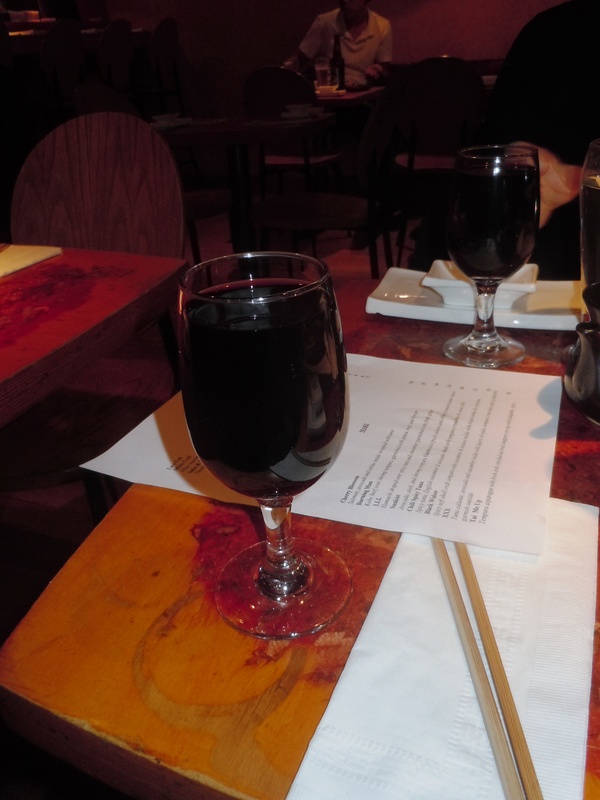 But after dining there, I felt compelled to write something about it, as it was incredible. So I apologize for the lack of photos! The restaurant is at the end of Broad Street in the Financial District, with a small patio for outdoor dining. The décor is clean and almost beachy, with white-washed walls and blue accents. The menus are dazzling. As mentioned before, the cocktail menu is intriguing and sardonic, the bar menu has some great options and the dinner menu is small but has many tempting dishes. Since I couldn’t decide, I got the hand-rolled potato gnocchi from the dinner menu to start (house-made lamb sausage, charred broccoli raab, piquillo peppers, and shaved parmesan), followed by the buffalo duck drumettes (celery, blue cheese crumbles, ranch dressing) and the crunchy lobster tacos (chipotle crema, mango salsa, habañero pipette), both from the bar menu. The gnocchi was impossibly light (it almost melts in your mouth) and the lamb sausage had a lot of flavor. The buffalo duck drumettes—an instant hit with me since I haven’t been able to find proper buffalo chicken in San Francisco, and am a sucker for duck—arrived as three drumsticks about 8 inches long. I wouldn’t exactly classify them as buffalo, as they weren’t very spicy and had more of a barbeque flavor to them, but they were still crispy, tender and delicious. I didn’t even use the side of ranch dressing because the crumbles of fresh blue cheese on top perfectly balanced the sauce. Finally, the lobster tacos (without the mango salsa, as mango is in the nut family) were great, heaping with lobster and not too much mayo. The habañero pipette was quite literally a pipette; it looked like a tiny test tube. I think I still prefer a traditional lobster roll, but this was a really unique spin. My dad got the spicy P.E.I. mussels to start, which were delicious—really flavorful and fresh, without being too fishy or salty. The garlic bread accompaniment, dipped in the broth, was amazing. For his entrée he got the pan-seared scallops (crispy farm egg, chorizo emulsion, shallot-radish salad, fresh & freeze dried corn) which were fresh and perfectly seared, with lots of flavor. The crispy farm egg was a poached egg that was lightly fried, so when you cut into it the yolk came oozing out. Delicious. My mom got the braised veal cheeks (with green peppercorn syrup, potato purée, frisée salad and watermelon tartar), which just melted in your mouth. The potato purée was a lighter take on mashed potatoes, and the watermelon tartar was an interesting addition. For dessert, we got the Chèvre Cheesecake (with graham cracker tuile, compressed melon and lemongrass ice cream), which was impossibly creamy and delicious. 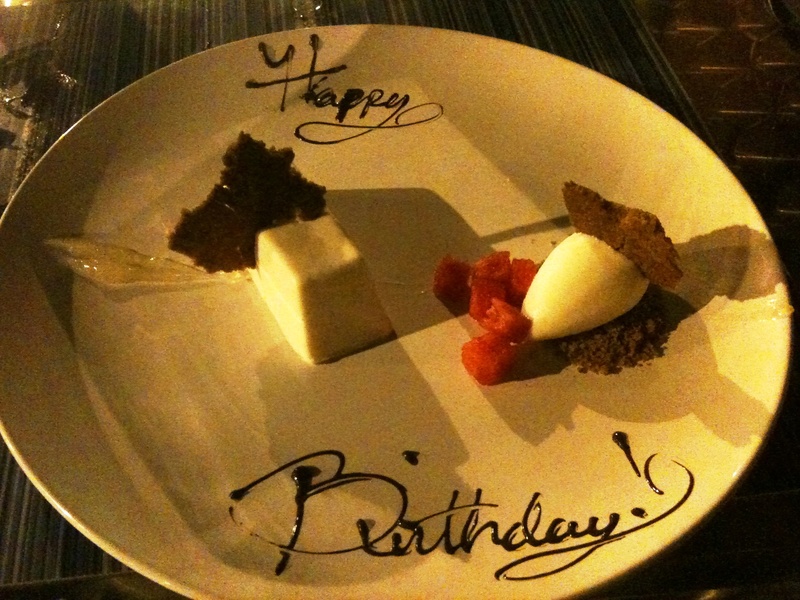 It was the perfect portion—a few sweet after-dinner bites that don’t tip you over the edge into uncomfortably full—and was presented beautifully, even down to the “Happy Birthday” in chocolate. From the level of service, you would have no idea the restaurant was only eight weeks old. Our server, Stephanie, was wonderful—funny, helpful and attentive. When I asked her about nuts, she was very understanding, and checked with the kitchen on everything (and even reminded me between courses that she was doing so). But here was the most amazing part of all—my brother was supposed to join us, but got out of work very late and didn’t end up making it there until after we had finished our entrees. When he told us he was on his way, we put in an order for the boneless buttermilk fried chicken (with celery root mousseline, habañero bbq syrup, wilted greens, avocado salad and farmers cheese), and the food arrived before he did. After about five minutes, Stephanie asked us if we wanted it under the heat lamp, and we said not to bother because he wasn’t picky and should be there any minute. She kept coming back and urging us to put it under the heat lamp, and we kept refusing, until the manager came over and we assured her as well that it wasn’t a big deal. She insisted on taking back the dish and making it all over again right before he got there, so it would be hot and ready to go when he arrived. Now that is service. The restaurant is a bit on the pricier side, but not outrageous, and definitely worth it for the delicious food. If you find yourself in Boston, I highly recommend you find your way over there! Sure, you can get your California rolls and Spicy Tunas and call it a day. 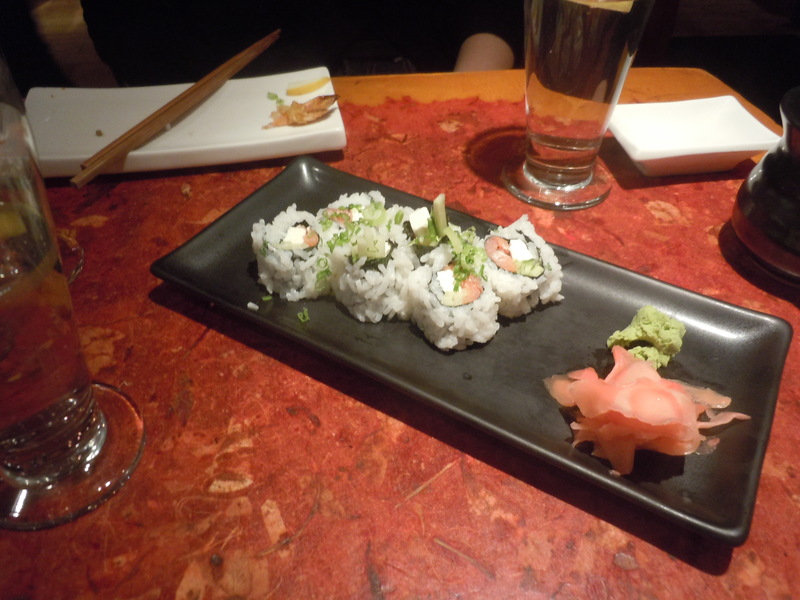 But if you’re feeling a bit more adventurous, Sushi Groove has you covered. 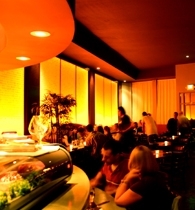 Even before I lived in the city, Sushi Groove was one of my favorite spots. Hiding behind the trees of Hyde Street in Russian Hill, the small space has a limited amount of tables, plus eight to 10 chairs at the bar—where diners get a front-row seat to all the sushi-making action. 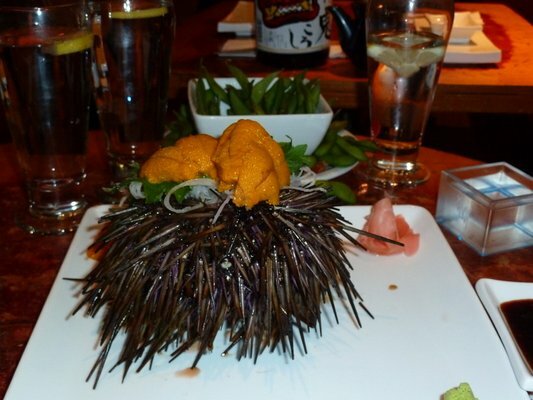 That’s sea urchin, or uni. And when I say they would not rest, I mean the birthday guy grabbed my hand, pulled me over next to him, and held a pair of chopsticks in front of my face until I picked them up. Uni is definitely an acquired taste—the texture is akin to a tongue, and to me it tasted like a combination of soap and clam bellies. The somewhat inebriated birthday guy attempted to eat the urchin spines before his friends stopped him. The menu is exhaustive and inventive, with a California cuisine spin to many traditional Japanese staples. The maki offerings range from your standard tuna roll (Tekka maki), to the Sake Kawa Roll (grilled salmon skin with scallions), the Oshinko maki (Japanese pickled radish) or the Shiitake maki (shiitake mushroom roll). Special maki rolls include the Wayne’s World (yellowtail, salmon, spicy sauce and cucumber, rolled inside out with tobiko and scallions) and the Pete’s Roll (spicy white tuna and scallions inside, layers of baked spicy salmon outside). 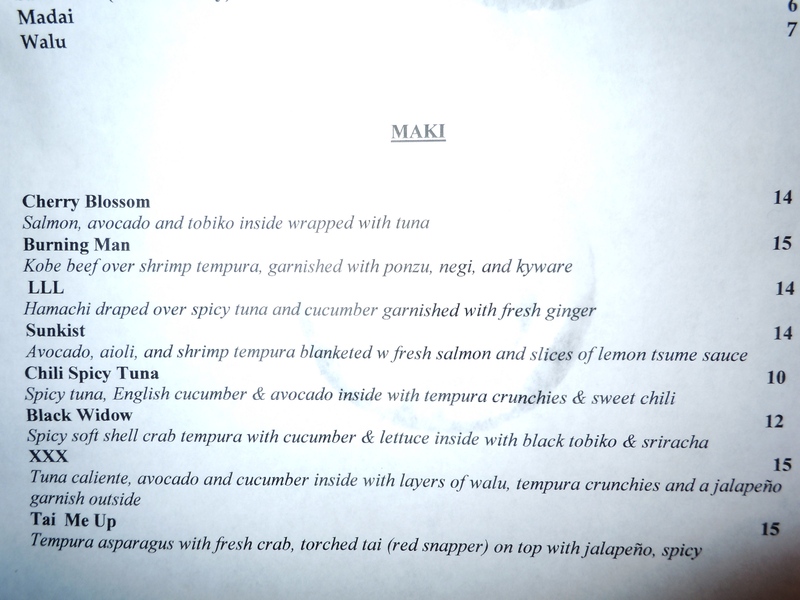 The daily specials are particularly playful, as seen below (with apologies for the dismal picture quality). 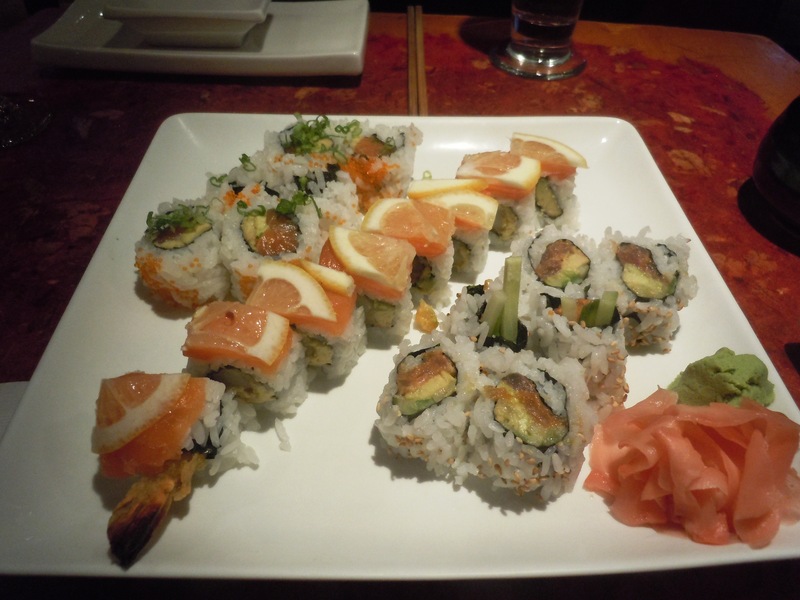 We started with the Kamikaze roll (salmon with avocado, scallions and tobiko), the Spicy Tuna roll, and one of the special rolls, the Sunkist (avocado, aioli, and shrimp tempura, topped with fresh salmon and a slice of lemon). When I asked about nuts, she confidently assured me that I had no need to worry, they didn’t use any nuts in the restaurant at all. Those with sesame allergies should definitely steer clear though. All three rolls were fresh and delicious, with a good balance of ingredients on the Kamikaze roll and a satisfying amount of heat on the Spicy Tuna (I could have used a bit more, but I think the level was chosen to suit the most people). Our favorite was definitely the Sunkist, with the crunchy shrimp tempura adding a great layer of both taste and texture. The salmon and lemon were a perfect combination, as the lemon was quite mild (a Meyer lemon, probably?) and added just enough acidity and tang to balance the salmon. We weren’t quite full after those three rolls, so we went back for another small round, this time of the most Americanized sushi roll you can get—the Rollin’ Blues roll with smoked salmon, cream cheese, scallions and cucumber. This was probably my least favorite of the rolls, but still good nonetheless. One of the best parts of Sushi Groove is that the price is pretty reasonable, especially for the quality of food. After four rolls and two glasses of wine, we each paid $35 after tax and tip. So whether you’re in the mood to do sake bombs and dance along to some pop or reggae music, to spice up your sushi selection, or just to get some delicious, fresh rolls, Sushi Groove is a great bet. 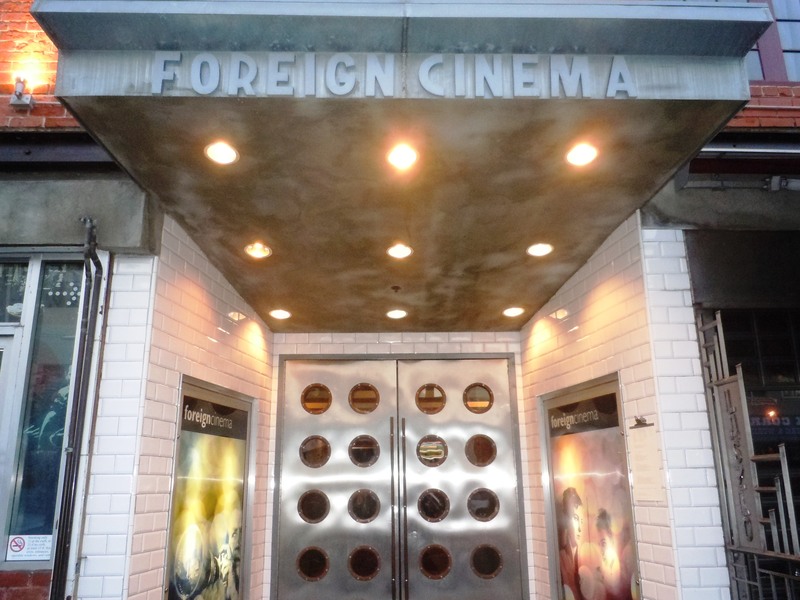 Foreign Cinema, a quiet and elegant spot seemingly hidden amid the loud chaos of Mission Street, takes dinner and a movie very seriously. Every night, starting just after sunset, the restaurant plays foreign, independent and classic films for the benefit of the diners sitting on the patio. (Currently the movie is “Breakfast at Tiffany’s”—click here for their movie schedule.) But even if you don’t make the movie—which can be difficult to do in the summer, when the sun sets as late as 8:30 PM—the dinner is well worth the trip. I went with my family on a Monday night during Dine About Town*, which meant the reservation options were slim and the restaurant full. However, they were still able to accommodate us easily when we asked for an outdoor table instead of the indoor one they had set up. Walking in through the giant steel doors, you are greeted with a long and beautifully lit hallway—red carpet and all—leading to the hostess stand. The indoor dining room is chic but understated, with a clean and minimal décor of mostly white tablecloths and chestnut wood. The outdoor patio looks similar but with strings of lights overhead, while heat lamps and a clear canopy over most of the ceiling made it comfortable even on a cool June night. Large, rustic windows separate the indoor and outdoor dining rooms, making both spaces feel bigger than they are. And for a nice bonus, a small modern art gallery off the outdoor patio serves as both an attraction while you are waiting for your food and a bar-equipped private party venue. Our waitress was extremely knowledgeable and very nice, and was very accommodating when we asked about our nut allergies. The bread turned out to be nut-friendly (but my fellow allergic sister and I still chose the white bread over the wheat one just to be safe), and our entrees were as well. The only thing that was not safe was the calamari my father had ordered, but she offered to put the sauce on the side or to remove it entirely, and we chose the latter. Two sweet, tiny Kumamoto oysters on the half shell with mignonette sauce were a wonderful start to the meal, followed by Indian-spiced calamari baked with romesco sauce (but without the sauce for us). The calamari was incredibly tender and flavorful, served in a great broth with slices of toasted bread. We waited about 20 or 30 minutes for our entrees after they had cleared our appetizers, but it was worth the wait. 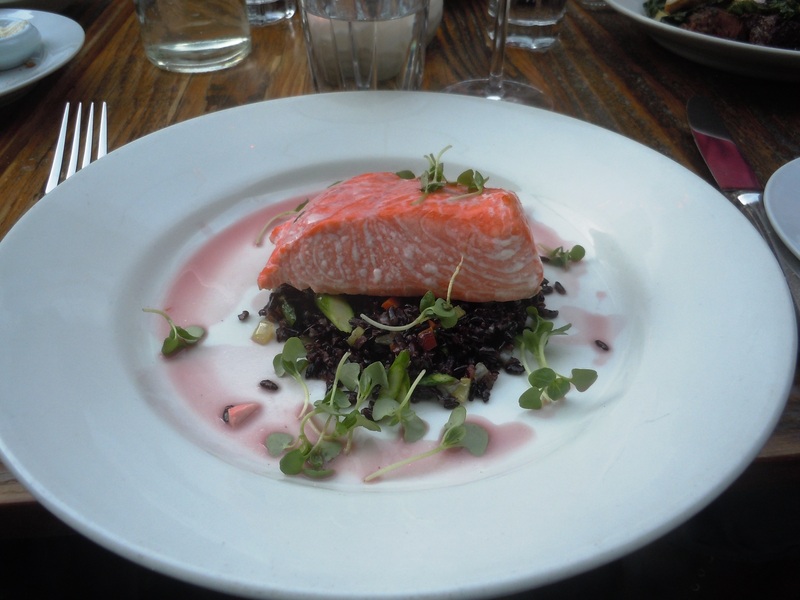 I had the king salmon with black rice, asparagus, carrots, sweet onions and microbasil. The salmon was buttery, flaky and light, while the black rice was cooked perfectly—tender, but still tough enough to have a great contrasting texture. The asparagus was sliced into half-inch pieces, and the onion and carrots were chopped finely, adding another subtle layer of flavor (the asparagus was amazingly sweet and flavorful). I would have loved a slightly larger serving size, but I was still satisfied after finishing it. 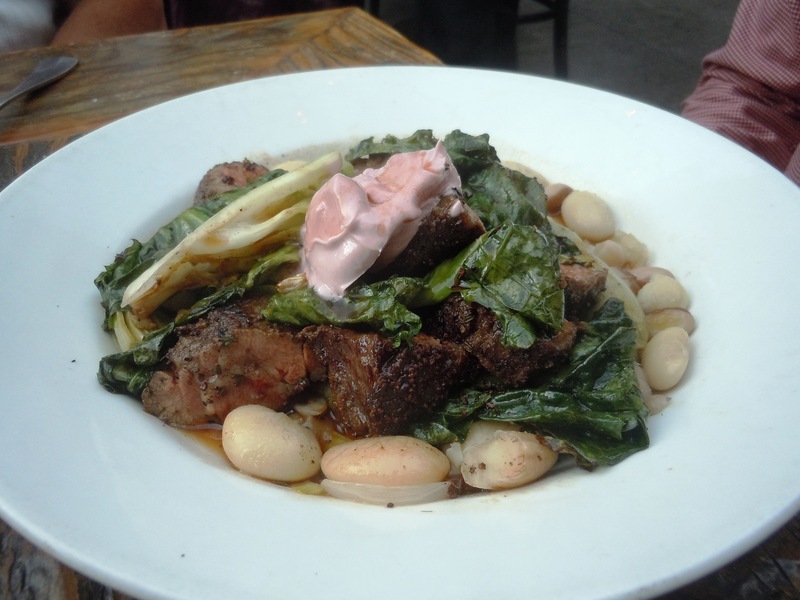 My brother and father had the bavette steak with endive and butter beans, while my mother and sister had the sole, and both dishes were very well-received. I hadn’t checked about nuts for the steak so I had to take my brother’s terse and non-helpful words for it, but I can attest to the fact that the sole was delicious—light and flaky, it had a beautiful golden crust and a smoky flavor. It was served with an aioli-style sauce of eggs, Dijon mustard, chives and parsley, which complemented it wonderfully. The dish also included roasted potatoes (confirmed to be roasted in grape seed oil), which had a seemingly impossible combination of crispy skin and an inside so tender and soft it just fell apart in your mouth. Unfortunately we didn’t have room for dessert, but did have some great coffee. The meal was definitely not cheap (thanks, Dad! ), but everyone agreed it was delicious. Definitely recommended! But if you’re watching your spending, it may have to be relegated to the special-occasion list, at least for dinner. I hear they have a great brunch, so that’s always another option. *I can’t speak to the Dine About Town experience here because we did not order off that menu. Sorry! “The Town” Favorite: Figs in Charlestown, Mass. This week I’m back in Boston to attend my little sister’s high school graduation (congrats, Kristen!) so I made sure to hit some of my favorite places. Stop number one: Figs in Charlestown. Figs is a Todd English restaurant (one of his first, I believe), the casual cousin to his more famous Olives, which is just a few blocks away. (For my money, having tried both, Figs comes out the winner—for your stomach and your wallet!) 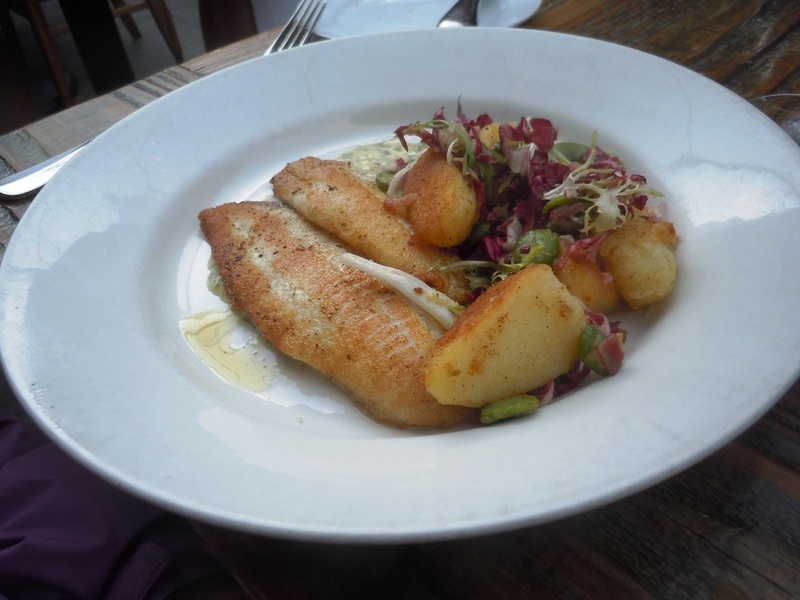 Figs is tucked away on tree-lined Main Street in Charlestown’s gaslight district. 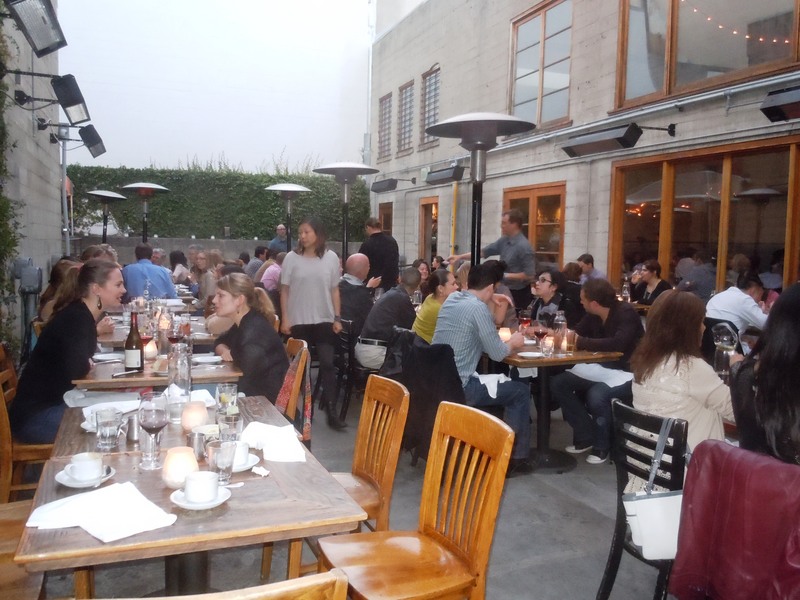 It’s pretty tiny—you certainly get cozy with your neighboring tables—but the dark wood and even darker lighting lends a slightly upscale look to what otherwise feels like just your typical beloved neighborhood spot. The pizza station and brick oven are open so you can watch them making the pizza, but no one seems to notice, instead chatting with their dining companions and diving into the huge pizzas. My friend and fellow “townie” Ashley joined me a little before 7 PM on Monday and we had our pick of tables, but it started to fill up towards 7:30. Later in the week, reservations during peak hours are advised. The menu is overwhelming, not for its size but for its array of tempting options. The pizzas are definitely the specialties, though I’ve heard good things about the pasta. Pizza options range from the traditional—bianco, crispy eggplant, four cheese—to the more unique, such as the shrimp scampi pizza (spicy gulf shrimp with caramelized leeks and tomato sauce), the “Red Sox” pizza (caramelized onions, roasted red peppers, sweet sausage, mozzarella, tomato sauce and mustard aioli) and the calamari pizza (crispy calamari, tomato sauce, arugula, hot peppers and lemon aioli). The staff is always very attentive and friendly, and the service timely. Our server brought over focaccia bread topped with carmelized onions, with a side dish of various types of olives sitting in olive oil for dipping. When I asked if the bread had any nuts, he assured me that it did not; he seemed very well-versed in the restaurant’s allergy-friendliness, going on to tell me that they are very aware of the rising prevalence of food allergies and have even made their pesto nut-free, calling it “basil aioli” instead. When we ordered the pizza—half “Portobello” (portobello mushrooms, wild mushroom purée, roasted red onions, fontina cheese and truffle oil) and half “Fig & Prosciutto” (crisp rosemary crust with fig and balsamic jam, prosciutto & gorgonzola cheese)—and I asked him about again about nuts, he said there were no nuts in the pizzas but would make sure to inform the kitchen so they would be aware. After eating, I had no allergy incidents to report. The large pizzas are huge—served on a flipped-over baking tray, they hang over the sides. The crust is really thin and crispy, allowing the toppings to take center stage. 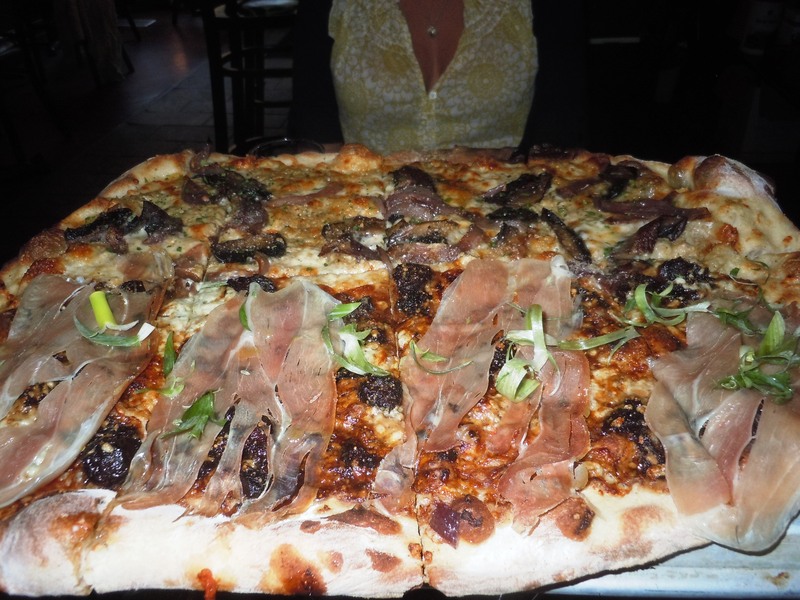 The prosciutto and fig is one of my favorite pizzas, not just from Figs but from anywhere. Big chunks of sweet fig jam are balanced out by thin, salty slices of prosciutto, scattered with green onions. Though the patches of gorgonzola lend another salty layer to the slice, the balance definitely still falls on the sweet side. The subtle drizzle of balsamic really rounds out the flavors and ties it together nicely. It may be slightly too sweet for some, but to my taste buds, it’s perfect. The portobello pizza is another favorite. Despite the fact that the mushrooms are the most represented ingredient, the standout flavor is really the truffle oil, lending a buttery overtone to the otherwise earthy pizza. The mushroom flavor is not at all overpowering—the portobello slices are roasted or perhaps even carmelized and are considerably spaced out, and the wild mushroom purée seems to be mixed with the fontina cheese and baked into the pizza itself. We each had a large slice of both pizzas and were too full to attempt another one, leaving us each with another two slices to take home. After the large pizza and a glass of wine or beer each, we each paid $20 after tip. Not too shabby! All in all, a delicious, relatively economical, reliable, allergy-friendly spot. They also do take out! If you find yourself in or around Charlestown, definitely stop by. Last Thursday was one of those days so beautifully sunny that it’s actually painful to go back into the office after picking up lunch. 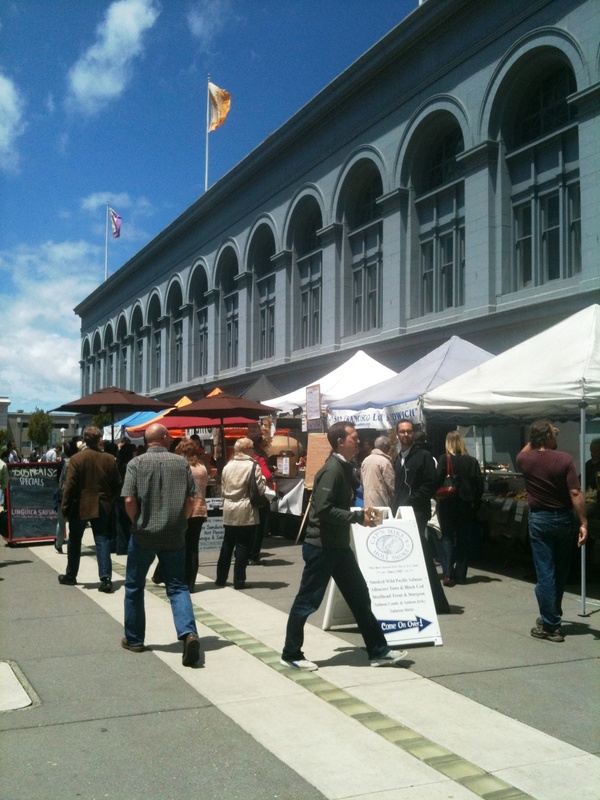 Especially because it was a Thursday, when the farmers’ market transforms the Ferry Building into even more of a food paradise than it usually is. I could just wander around the tents all afternoon, sampling food and enjoying the sun… working next to the Ferry Building is a foodie’s paradise, but so financially and calorically dangerous! 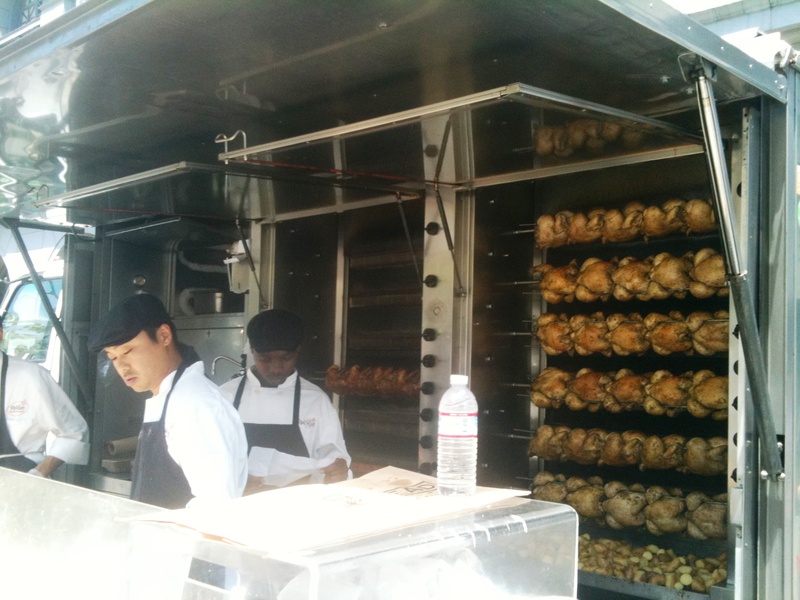 I decided to try the RoliRoti truck, whose porchetta sandwich I have been longing to try. It regularly gets rave reviews, including a spot on the Men’s Health magazine list of the Top 10 Best Street Eats in America and 7×7 magazine’s 100 Things to Try Before You Die (2010 list). The only reason I was able to feasibly get a RoliRoti porchetta sandwich on my lunch break was because I went at 1:45 PM—otherwise the line is up to 45 minutes long. Fortunately for me, I only had to wait less than five minutes. Though the rotisserie chickens looked and smelled so wonderfully tempting, I had to stick to my original mission. When I got to the front of the line and asked what the porchetta sandwich was, the man behind the counter told me it was pork loin wrapped in pork belly, stuffed with herbs and roasted. It’s then sliced and put between pieces of French loaf, with some arugula. When I asked about nuts, he very confidently said, “no,” and I didn’t have any problems after eating it. But I would have felt much better had I known the exact ingredients of the herbs and spices, not to mention where the bread was from. This is an even more important reason to go on off-peak hours—you can spend a little more time asking about allergens without holding up the line. The sandwich, which was $8.50, was worth every good word written about it. It was packed with so much flavor, thanks to the crispy pork belly skin layered into the sandwich. It had just enough salt to have that delicious, sea-salt-esque flavor, but not enough to be overwhelmingly salty. The spice mix rubbed into the skin was impeccable… If you love eating the fatty, crispy, salty skin of a roast chicken, you would be in heaven (as I was). The pork was really tender, and there was just enough of it to be satisfying but not too much to make the sandwich difficult to eat. I was torn between wanting some kind of chutney, mustard or sauce on there, but not wanting to distract from the amazing flavor of the pork. 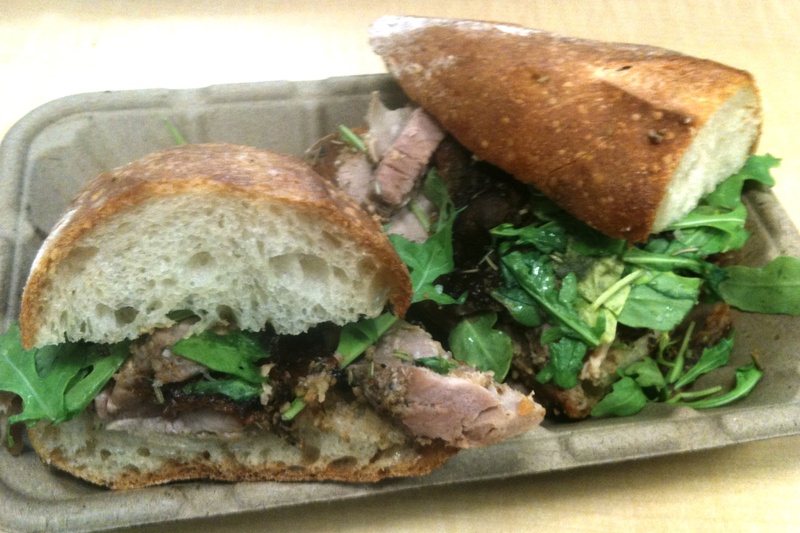 It really was that simple—pork, arugula, bread. But it punched far above its weight. I would gladly wait 45 minutes for that sandwich again! Ambiance: not sure how to rate a food truck on this!